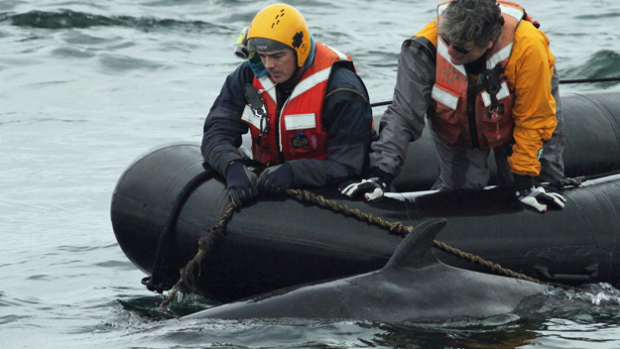 Minke Whale Disentangled Off Boston Harbor – Neptune 911! PROVINCETOWN (CBS) — A small whale was rescued by a team from the Center for Coastal Studies over the weekend. The Marine Animal Entanglement Response team found the minke whale towing a rope and buoy, ten miles outside of Boston Harbor. The whale had a buoy line wrapped tightly around its lower jaw. The responders were able to make a single cut to the line and free the whale, which then swam off vigorously, the team said. The rescue occurred shortly after the Center for Coastal Studies reported that about 100 endangered whales were feeding in Cape Cod Bay.